Our free-range chickens come from the heart of East Anglia. Banham Poultry is in Attleborough, a small village in the heart of the Norfolk countryside. These birds are bred free from any growth promoters, routine antibiotics and genetically modified feeds as are our Sutton Hoo free range and organic chickens. These are reared in the heart of Suffolk and are left free to roam on 40 acres of tussocky grassland pasture overlooking the River Deben near Woodbridge, next to the ancient Anglo-Saxon National Trust site at Sutton Hoo. They are naturally slow growing “old fashioned” birds that produce a delicious, full taste. 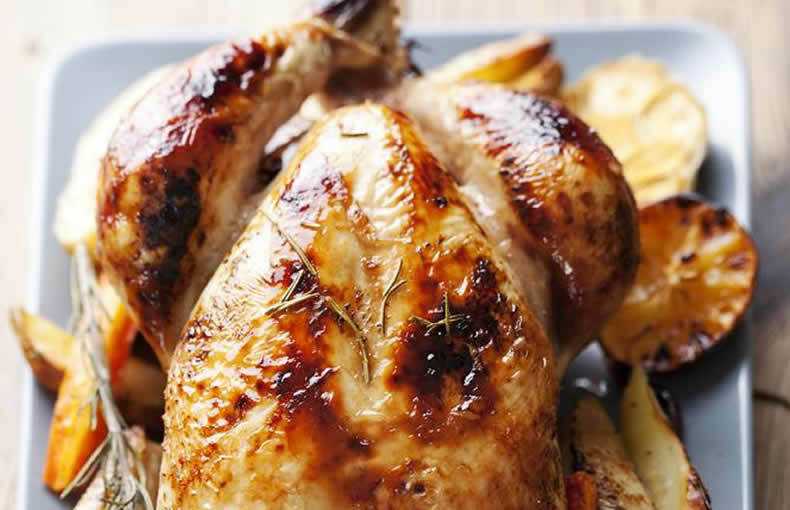 Our Butchers have a great selection of whole oven ready birds as well as selected cuts, ready prepared and marinated chicken dishes available in our counters for you to choose from. If you require a smaller bird or one per person, we have delicious French Poussin available too. Really, roasting a good quality chicken doesn’t take much. The natural fats and flavours of the skin and carcass do most of the work and you’ll need to add no more than a good seasoning with salt and ground pepper along with a drizzle of olive oil. A sprig of fresh thyme or rosemary and a few cloves of garlic placed in the cavity of the bird during roasting add flavour too. And to really add a finishing touch, a few rashers of our delicious smokey dry cured bacon provide further basting and make for a crunchy snack with a glass of crisp, chilled Sauvignon Blanc while the meat is resting. See our wine recommendation below! Our top tip...don’t over cook! If you haven’t got one then buy a meat thermostat (place it in the inner thigh area near the breast of the bird) so that you can see when the joint has reached 73 °C. Cover with foil and allow to rest for 20 minutes. A simple roasting guide can be seen on our website. Don’t forget the accompaniments. Ask our Butchers to advise on you on the best stuffing, gravy, stock, sauces and fresh herbs to serve with your Chicken as they make all the difference! We even have oven ready roast potatoes and fresh vegetables to complete your perfect Roast. Back to that mention of the wine...Avie, our sommelier, recommends two fruity wines that will work well with your Roast Chicken. The fresh and zesty Excelsior Sauvignon Blanc 2012 or the smooth Santa Julia Pinot Noir. Choose your favourite in-store on Saturday when they are both available for tasting.